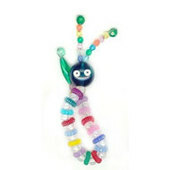 Spaghetti Add to your worms to make a rattle snake with this long bead, add them into your star pattern to give extra size. Add a few round or facet beads next to the Spaghetti Beads and make a fringe for your next scarf or the bottom of you bag. Bead 19mmx6mm central hole 1.5mm.